How Can Aging Adults Prevent Kidney Disease? 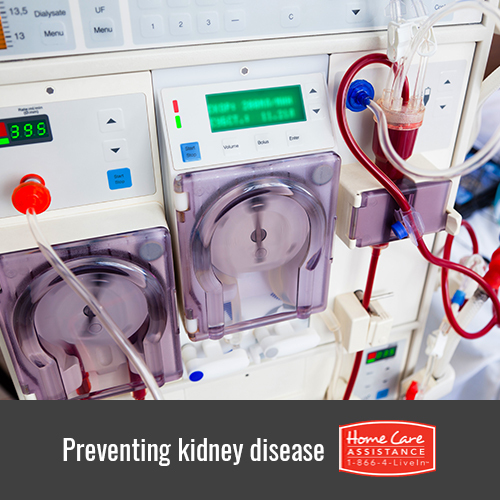 Kidney disease is sometimes a natural part of the aging process, which makes it difficult for some seniors to prevent. However, it is possible for your elderly loved one to reduce the risk of kidney disease or slow its progression if it has already developed. Harrisburg senior care experts recommend taking these preventive measures. Diabetes is often associated with kidney disease and is much more likely to develop if normal blood sugar levels are not maintained. If your loved one has diabetes, be sure he or she follows all of the doctor’s directions and eats as instructed. Blood sugar control and maintenance can be greatly helpful in protecting against kidney issues. Elevated blood pressure, also known as hypertension, is also linked to kidney disease. Whether your loved one controls his or her hypertension with a low-salt diet, meditation, or prescription medication, he or she needs to keep blood pressure at a safe level. It doesn’t necessarily have to be perfect, but it is important to lower high blood pressure whenever possible. Together, diabetes and high blood pressure account for two-thirds of kidney disease diagnoses in the United States, making it important for your loved one get tested for both of these conditions. While your loved one can’t turn back the clock if he or she has already developed diabetes or hypertension, he or she can still receive help with annual kidney function testing. Kidney disease often comes without symptoms but can be slowed more easily if detected early. A simple urine test is all that is needed to check kidney function, so your loved one should ask for one at the next checkup with his or her doctor. A nephrologist is a doctor who specializes in kidneys and is an excellent resource for seniors who have been diagnosed with kidney problems. If your loved one has developed kidney disease or is at high risk for the condition, he or she should see one of these specialists for help controlling the disease and slowing its progression. The prevention of kidney disease and other serious health conditions can be made much easier with the help of a professional caregiver. At Home Care Assistance, our caregivers are available around the clock to provide transportation to and from medical appointments, prepare nutritious meals, assist with exercise, and help with many other important tasks. We also offer specialized Parkinson’s, post-stroke, and dementia care Harrisburg seniors and their families can rely on. For more information on how our elderly care services can promote you loved one’s health, call one of our knowledgeable Care Managers at (717) 540-4663 to request a free in-home consultation.